Every spring Lions all over Arizona are found in classrooms taking part in our Flags for First Graders program. Lions share the the history of our flag, its traditions, and its importance. 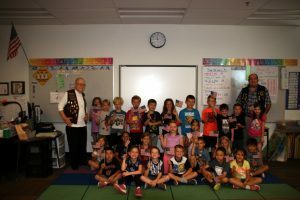 After the presentation every single first grader is given their very own American flag. This activity can be done at any time but most clubs give out the flags around President’s Day. Some clubs simply present the flags to local schools but most clubs have Lions put on a presentation. Our program supports the in class flag curriculum. Lions proudly wear their vests and other club gear at these presentations. Lions Barbara Shine & Karen Pryce are our project chairs. Below you will find 2 help packets loaded with outstanding material. Just click to download and print them out!